In 2000, Cranbrook Schools in Bloomfield Hills, MI began raising money to support a village school in the impoverished village—Namtenga—in Burkina Faso, Africa; providing school supplies, uniforms, a water well with pump and more. 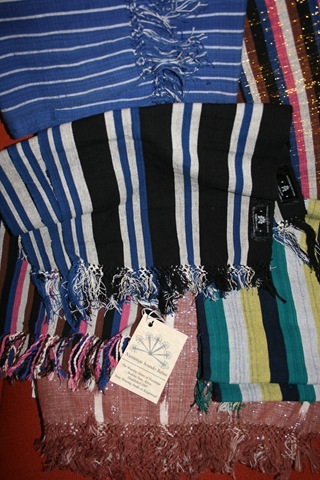 In 2005, the program expanded to providing more than 30 women with a trade in creating woven products such as scarves, blankets and wraps to help support their families. With the holidays upon us, instead of buying that wrap from a major department store, why not give your loved-one one of these handmade scarves? The products range from $45 – $200, and all the proceeds go to the Namtenga Project. You can pick them up at Optik which specializes in vintage and contemporary eyewear and accessories, located in Birmingham at 245 West Maple. But I’ll warn you in advance, it will be very difficult to leave without finding something else there that you can’t live without. 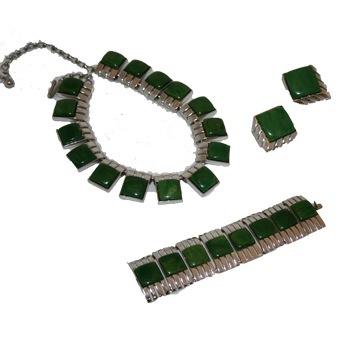 Optik has some of the most incredible and unique pieces in the area, like this set by recent NY transplant, Joann Goldberg; who currently resides in Royal Oak. So there’s no need to harbor any shopper’s guilt—not only are you purchasing a beautiful gift—but you’re a benefactor to worthy cause and you can support the local economy. How can you go wrong? Happy Shopping!